Use these tips to select the perfect shade structure for your business! If you need a new shade structure for your business, there are a handful of things to consider before you get started. As you choose a new shade structure, you will first need to determine your needs for your investment. Why do you want to purchase a new shade structure in the first place? Consider whether appearance or functionality is most important in your decision so you can select the best option for your needs. Keep reading to see a few practical considerations regarding the appearance and functionality of a new shade structure for your business. Should your new shade structure be the focal point of your business? While many business owners may not consider this at first, it is essential to decide whether you want your shade structure to be the first eye-catching element of your establishment. A large, brightly-colored shade structure will instantly catch the attention of a potential customer and can provide almost business with the right amount of character and detail. Additionally, a shade structure can also play a key role in transforming the appearance of any establishments. For example, a neutral color building will instantly appear brighter with a brightly-colored shade structure at the front entrance. Many businesses owners want to invest in shade structures primarily for function. Businesses such as restaurants and coffee shops may use a shade structure to provide shade for customers seated in outdoor seating areas. If practicality is a priority for your new structure, a conventional shape and color will fit seamlessly with the appearance of your building. Visually appealing buildings and structures typically involve a cohesive design, colors, and visual symmetry. 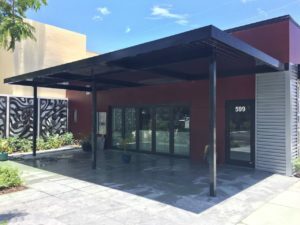 If your goal is to invest in a new shade structure that is complementary to the appearance of your business, it is essential to consider both materials and colors that are eye-catching and visually appealing with your building. Let your new structure complement the look of your business by reflecting the features of your storefront with a seamless and professional image.